MDF(Medium Density Fiberboard):Waterproof and No deformation, Durable and Solid. Unique robot shape and multicolored appearance, bring joy to children. As a large lego, assembled together with children,improve the child's hands-on ability and develop brainpower. Enjoy This Robot Bookshelf . This Robot Bookshelf is SOLD by Vogue Carpenter.Please check the package and brand when you receive it. If you have any questions about this bookshelf,please contact us by email-housecarpenters@outlook.com,I will reply in time .Meeting Customers satisfaction is our purpose forever. Thanks for your attention and purchase in Vogue Carpenter. ROBOT BOOKSHELF--Stable:Floor design, strong stability. ROBOT BOOKSHELF--Large Capacity: 4 layers 7 cubes for putting books、toys、trophies, etc.,make the kids room clean and tidy. ROBOT BOOKSHELF--Wear Prevention: Six rubber gaskets as supports of the bottom to prevent bottom wear and floor friction. 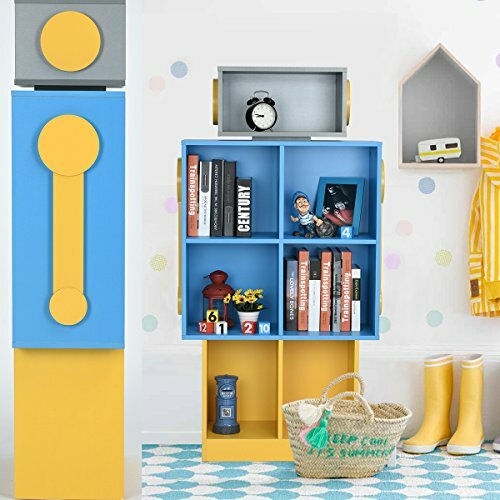 ROBOT BOOKSHELF--Unique Design: Unique robot shape and multicolored appearance, bring joy to children. If you have any questions about this product by Vogue Carpenter, contact us by completing and submitting the form below. If you are looking for a specif part number, please include it with your message.